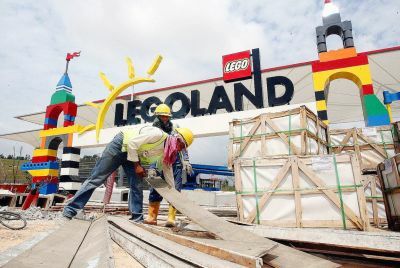 New attraction: Construction work under way at the Legoland theme park in Nusajaya. KUALA LUMPUR: For UEM Land Holdings Bhd's fledgling Nusajaya region, the next stage in its growth will be driven by new catalyst projects that are expected to be unveiled soon. “We have concocted and put on the ground the initial catalysts, but we cannot live on what has been successful in the past, so new projects will be developed,” managing director and chief executive officer Datuk Wan Abdullah Wan Ibrahim told StarBiz. “We have a few that are on the table and very advanced, but I can't talk about them yet,” he said, adding that official announcements would be made in the fourth quarter. UEM Land is the master developer of the 23,875-acre Nusajaya, which is one of five flagship zones in Iskandar Malaysia, the country's first economic growth corridor in Johor. Now in its second phase, the 2,217 sq km Iskandar Malaysia that was launched in 2006 needs average investments of between RM15bil and RM20bil per annum from 2011 to 2015, up from RM10bil to RM15bil targeted for 2006 to 2010. A five-year progress report by the Iskandar Regional Development Authority had projected that Iskandar Malaysia requires a staggering RM383bil in investments over the next 20 years. “I believe we have very good prospects, and the single biggest factor we are hanging our optimism on is Nusajaya. I have struggled 6 years trying to put Nusajaya where it belongs. “After six years, I can tell you it has arrived at its 'tipping point'. By the end of the year, a lot of initiatives would be completed and in operation. This will result in a new demand structure for our projects down south,” Wan Abdullah said. This “new demand structure”, he explained, meant that if the developer previously sold 800 units in a year, it might be able to double or even triple that amount post-tipping point. “Nusajaya is unique because it is not leveraging on the local market. Our market is the world because of its proximity to Singapore. Wan Abdullah says new projects will be unveiled soon. “UEM Land, compared to the other developers, I dare say, has the best opportunity in these current times,” he said, adding that the company was the biggest private landowner in Johor. This year is touted as the “tipping point” for Iskandar Malaysia as many of its major projects and infrastructure, including the coastal highway to Johor Baru, Legoland Malaysia and two new colleges in EduCity, would come onstream. In Nusajaya, UEM Land has four ongoing projects: East Ledang, Nusa Idaman, Puteri Harbour, Nusa Bayu and Horizon Hills, which is a joint-venture (JV) with Gamuda Land Bhd. The high-rise, waterfront Imperia condominiums in Puteri Harbour, its first residential development there, has seen a take-up of 85% since its launch nine months ago and an average selling price of RM725 psf, with prices reaching RM1,000 psf in the upper floors. Asked if the company, which is 65%-owned by Khazanah Nasional Bhd, has felt any impact from Bank Negara's responsible lending guidelines, Wan Abdullah said: “Of course. Anyone who tells you (otherwise) is not telling the truth. If it is good for the country, I'm resigned to the fact. However, he conceded that “it may not be good” for the company's short term performance. On the possibility that the Government may raise the floor price for houses sold to foreigners, Wan Abdullah said he was not concerned. “Our products in Nusajaya are upmarket. The bungalows are over RM3mil and apartments over RM1mil, especially those in the waterfront. If they say foreigners can only buy RM2mil and above, then I think I will pack it in,” he said with a laugh. In April, StarBiz had reported that a proposal was being talked about to set a minimum price of RM1mil on properties bought by non-Malaysians from RM500,000 currently in an effort to prevent runaway house prices. Sources had also said the revised price threshold may be slightly lower at RM800,000 for residential properties in selected economic corridors such as Iskandar Malaysia.